Paul McCarthy (born 1945, United States) started making videos in the late 1960s in Southern California. His performances are often absurd and disturbing twists on beloved American legends, myths and icons. In Pinocchio Pipenose Householddilemma, McCarthy dresses in a modified Pinocchio costume with an exaggerated fake nose, which he uses to ingest ketchup, mix condiments, and poke holes in the structure. 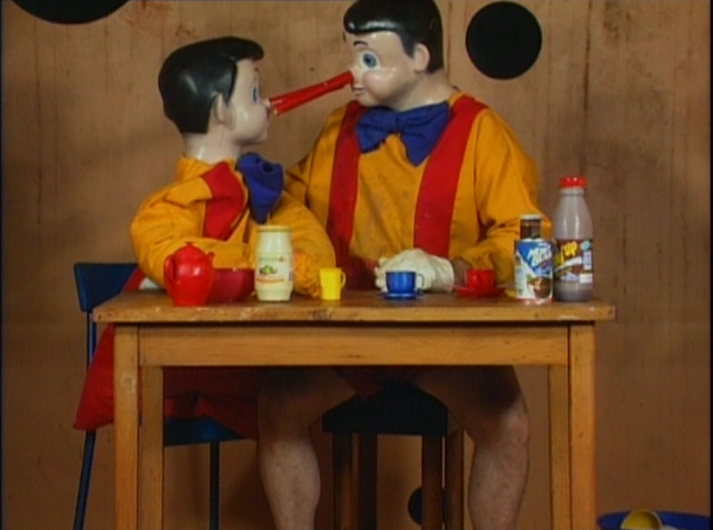 Another Pinocchio figure enters the scene toward the end of the video and the two characters aggressively interact with each other physically using their costumes and props. McCarthy is interested in pushing the boundaries of a nostalgic childhood character as well as the limits of his audience. The characters shown are not the fictitious and playful do-gooders we grew up with. Pinocchio Pipenose’s explicit and disturbing play challenges our innocent memories of the fairytale Pinocchio. PlayTime curator Trevor Smith describes how McCarthy’s Pinocchio Pipenose character is emblematic of the phrase: “play rewards misbehavior.” Read the transcript.